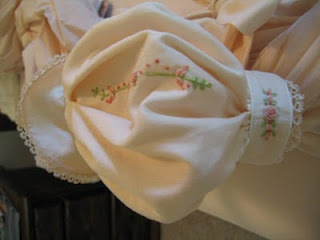 Especially when sewing boy's shirts, you do not want puckers or 'ruffles' in the sleeve. The pattern instructions always say to run two rows of gathering stitches in the cap of the sleeve, the problem with that is, you then have to work out those gathering puckers that form in the top of the sleeve. 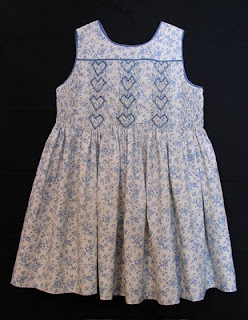 Having sewn for boy's for quite a few years I was thrilled to learn this technique for Nancy Zieman. You want to control the fullness at the top of the sleeve. So, do not let the fabric feed through, keep your finger at the back as you sew. 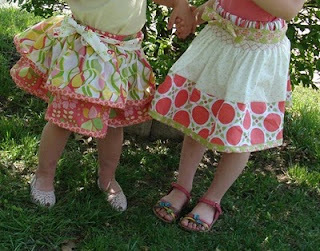 If to much fabric is piling up, you can let it go, and continue again with your finger in the back of the pressure foot. This also works on girls blouses where you want a smooth top to the sleeve. With this done, take the sleeve to the ironing board and steam it very well. Do not! touch the iron the the sleeve, just give it a good shot of steam to shrink out the fullness. Now, you have a nice neat sleeve without having those little tucks sneaking into your sewing. These simple steps will make a lining a jacket quick and easy. 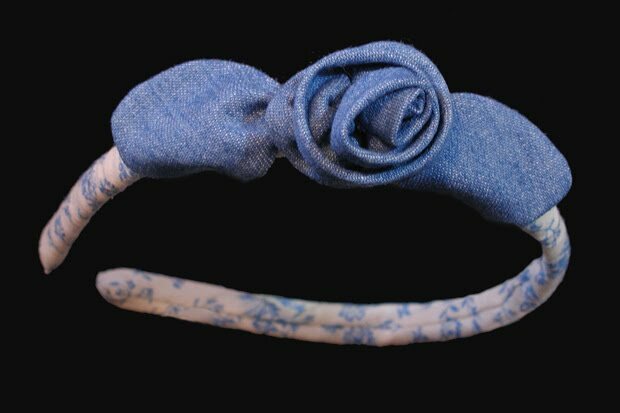 I used Bonnie Blue "Jillian" pattern. Love that pattern and am hoping to find it in a larger size. Sew your jacket pieces together, then sew the lining pieces together. Now its time to put the two together, you will place the lining to the jacket right sides together. Match edges and shoulder seams. Stitch along the front and along the lower edge. Stitch across lower back back edge. Stitch lower edge of sleeves. Trim and clip seam, I like to use my pinking scissors, they trim and clip at the same time. Remember your side seams are open at this time. Do not turn right side out. Line up the lining pieces and the jacket pieces. On one side of the jacket pin the underarm sleeve seam to underarm sleeve lining seam, right sides together. Continue pining jacket sides and jacket lower edge seam. Make sure lining is matched to lining and jacket is matched to jacket. This is a circular seam, you will sew the lining and continue sewing the jacket. Continue doing this on the other side but this time leave about three inches of the lining open, you will need to turn your work through that opening. this gives you a better view of how the pieces are kept separate. Now sew in one continuous line of stitching. There you can see how both are sewn, trim and finish seams. Pull the jacket through the opening you left in the lining. Turn jacket with right sides out and push sleeve lining into sleeves. Press well. There you go a little lined jacket. Now, you can add buttonholes or not, depends on how you want to finish. Top stitching always looks nice, or you could do decorative top stitching, its all up to you. Want to make something casual for the trip to Disney Land? These little outfit will get your creative motor started. I especially like the trims Jerry used. She always seems to add rick rack and now I started finding places to put rick rack. 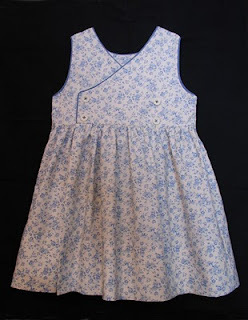 You could use any A-Line pattern when sewing these dresses. Martha Pullen has one that is very popular, I like to use the Bonnie Blue Holly pattern. Another little touch, is the buttons on the Mickie A-Line, they were machine embroidered. Little touches can make the most casual clothes something very special. Here is where to go http://ellieinspired.com/apps/blog/ to sign up for the new contest and I must add it is a very good contest!! Laura now has another pattern available and I have to tell you it is one I have been waiting for and bugging her about this adorable skirt pattern that even has a smocked version. This skirt goes up to size 8 is that not the greatest news?? I forgot to add it also has short built into the pattern for those little monkies. Zoe models her new dress saying the best part about being my model is she gets to keep the clothes. Her mom reported she thought Zoe was going to sleep in the dress as she would not take it off. I have not had a report back telling me if she slept in it. I for sure hope not!! With spring comes little leauge baseball and what can be more fun then watching those kids play their heart out. I am so lucky to be able to live close enough to some of the grands and so enjoy cheering them on. Big brother play's while sister cheers. Seth did very good last night. He was hit by a ball while sliding into second base, but he was safe and a little ice will take the swelling down on the lump on his leg. Seth and Zoe taking a moment to slow down and pose for grandma. For this dress, Jerry used the Sandpiper pattern by Kathy Dykstra from AS&E Issue 88. Really shows how versatile that pattern is and what a little creativity can do. 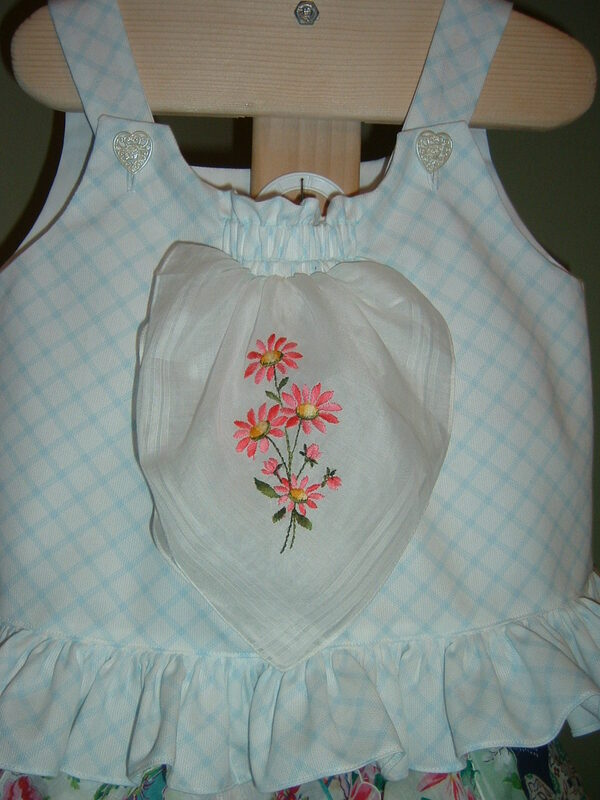 The apron overskirt can also be smocked as shown in the magazine. This is a view of the back. I love how Jerry combined colors, it really looks like it is under the sea. This little skirt is made almost like the hanky skirt. A little top added to make an adorable set. What little girl doesn't love tinkerbell? This outfit has been so popular with more wanting to see details, I will re-vist the skirt and top to give you even more detail. Details of the watch added. Extra little hankie tucked in. This is our entries to the challenge by Betty for us to actually make something from each new issue of AS&E. We decided to do our own interpretation, not to actually copy the design. I picked "Wild at Heart". I used CC pattern Lee for the dress. The roses are three strands not the six called for and the pansies are single looped cast on stitches not double looped cast on. Also not as many were added. Just a note to add, I found the fabric at Wal-Mart. When I saw it I just knew which design I needed to do with the fabric. Betty, chose whirligig, I came so close to picking the same one! We did not tell each other which design we picked. That way it remainded a surprise for both of us. The changes betty made- not being able to pleat more then 16 rows, she used the CC Mary De pattern, which gave her a yoke. I think she did a wonderful job , but you know us smockers we always pick out our mistakes and think the whole world can see them. Now, we wait for our next issue. I hope we interest more to join us. Yes, it does add a certain amount of stress, but it is good stress, the kind that makes you get something done. A larger view of the hanky dress. I am not sure if I can get one to show even a little larger but will work on it. We have shared pictures of each others sewing for years and I have never had any that were to small. It's my wonderful computer that is doing it all by itself!! So let me know if you would like me to try for a larger view of this adorable skirt. This outfit was for the Alice in Wonderland day at the park. 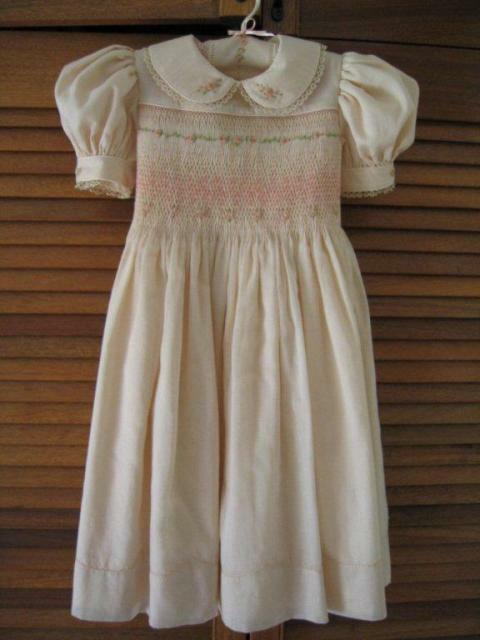 The pattern is "littlelambs" by Karen &company, no longer for sale. You can make them in any color, blue for boys works. 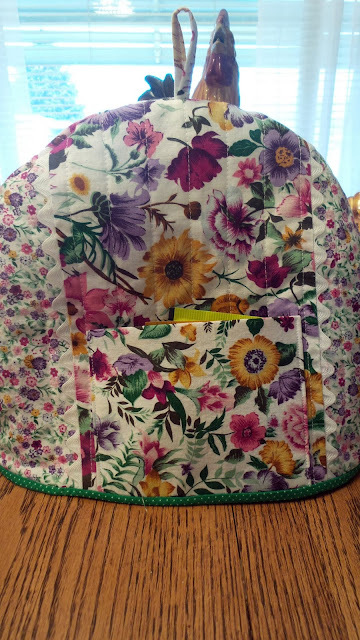 A bonnet I made that was also raffled. I think I need to make one just to keep. 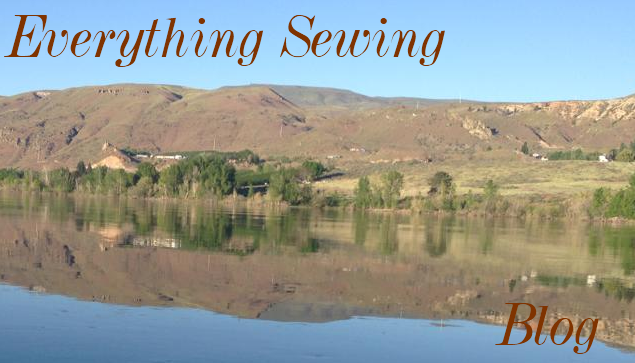 Goosegirl sews is having a contest!! Ya, we love giveaways. 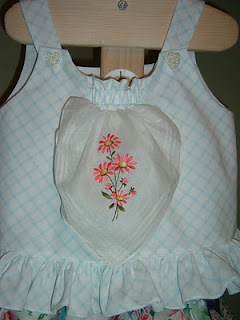 The prize will be an apron pattern she designed and it is so pretty. So hurry over and take a peek and while you are there sign up to follow. Sivje also sharesmany family stories so its a fun blog to follow. I will also add , so much work. My sewing friend made her granddaughter a wardrobe of new clothes to wear on her trip to Disney. They are all darling and so creative, I am sure it will spur your creativity. I will share a few at a time, so check back ofter. Also an update on the challenge from AS&E! Well, we both got done at the same time so tomorrow we will get to see what we came up with. I am so excited to see what Betty picked to make from the magazine. This little outfit features Snow white and the seven dwarfs. Each panel was a different dwarf. The applique work amazes me, maybe someday I will learn how to do it. This outfit features many hankies sewn to create a skirt. What a lot of work, it is so cute!! Buried someplace in the pages of this issue of AS&E, is my challenge. How did I get myself into this you ask? Well, it all started when my friend Betty and I were discussing renewing our subscriptions to the magazine. Both of us have years of back issues, with many projects, we have not taken the time to do. Oh yes, we looked at the pictures admired the beautiful items and some how left it at that. Oh, I have done a few but not very many. To renew or not renew was our dilema. Then the Email arrived! The one from Country Bumpkin! Oh, this can't be good, it offered six issues for the price of four. That is when a light went off for Betty "How about if we renew, then challenge ourselves and anyone else that would care to join us, in making one item from each new issue we get", offered Betty. I of coarse jumped at the offer, I often jump before I really think things through. How hard could it be? There are always so many cute items in the magazine and with a little encouragment, I was ready. So here I am, working on a project that in the past would have gone undone by me. Now I have this fear the next issue will arrive and I am not ready for that!!! Stay tuned for part two of this challenge and if you would like to, we would love to have you join us. This is the dress entered by my firend Lexie, in the Royal Arts Easters Show, which runs from the 1st to the 14th of April. Sydney, is the capital city od New South Wales. Lexie, is from tropical Queensland Australia. The dress is in two layers, the top layer being Peachy-Ecru swiss finella cotton. 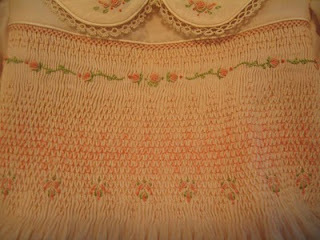 The second layer is Spechler-Vogel lawn in a soft peach. 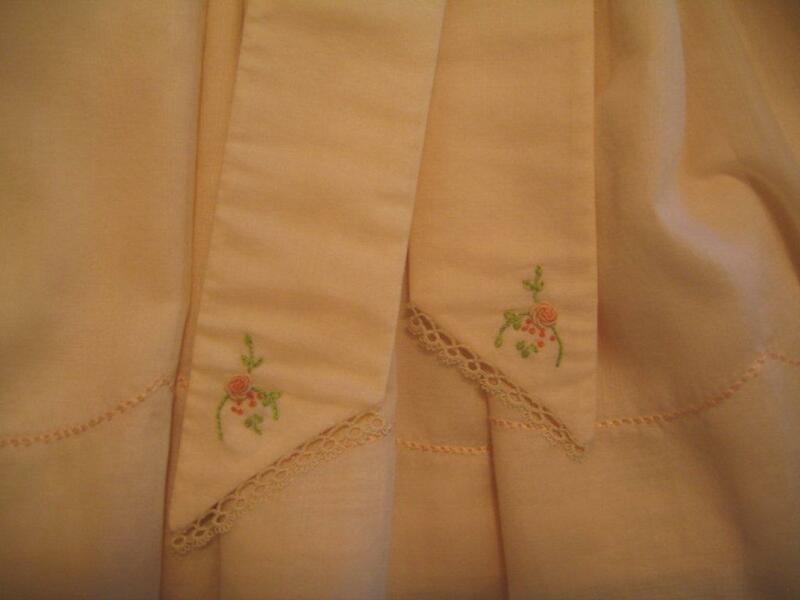 She used tatting lace in the shade of ecru for the collar, cuff and sashes. The puff sleeve has an embroidered inverted pleat. The satin mini-piping is in the matching shade of soft peach. 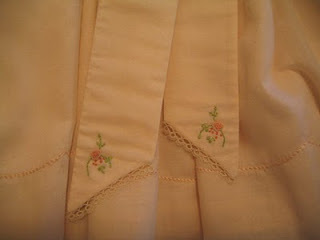 The scalloped hem is pin-stitched by hand and the buttons at the back were also hand embroidered with little rosebuds. 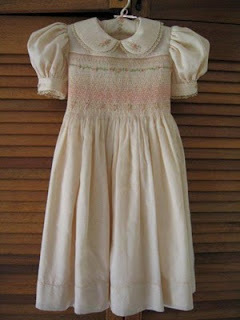 You will be happy to know Lexie bought everything for the dress in the U.S.A and most of it from Farmhouse Fabrics. 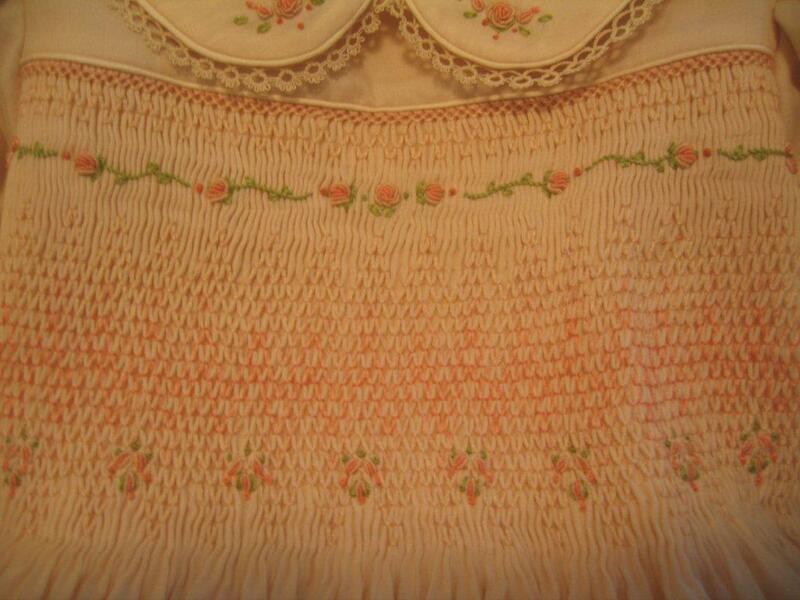 The smocking is the Van Dyke stitch in 3 shades of peach. Please notice--It is also displayed on its matching hanger. All the attention to the smallest details makes this dress so very special. Thank you Lexie, for letting me share this work of art.